Perspex disc: 45.7 cm diameter and 2.5 cm depth, motorised turntable: 11cm x 25cm diameter, spotlight: 40cm x 11cm, Perspex balls: 4cm & 5cm diameters. Liquid Reflections and the works leading up to it were Lijn’s first and most complex works with water and light. The Liquid Reflections series, inspired by her interest in astronomy and the physics of light, was the outcome of 5 years of experimental work with plastics and fire, acrylic polymers, lenses, prisms, light and finally water. 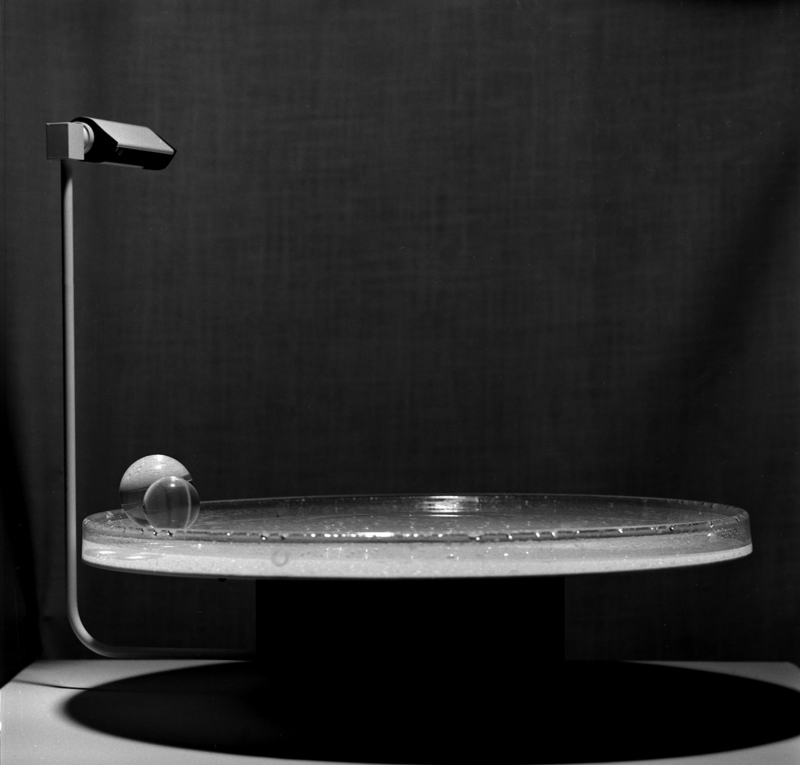 Liquid Reflections is comprised of a hollow acrylic disc, containing water and revolving on a motorized turntable. 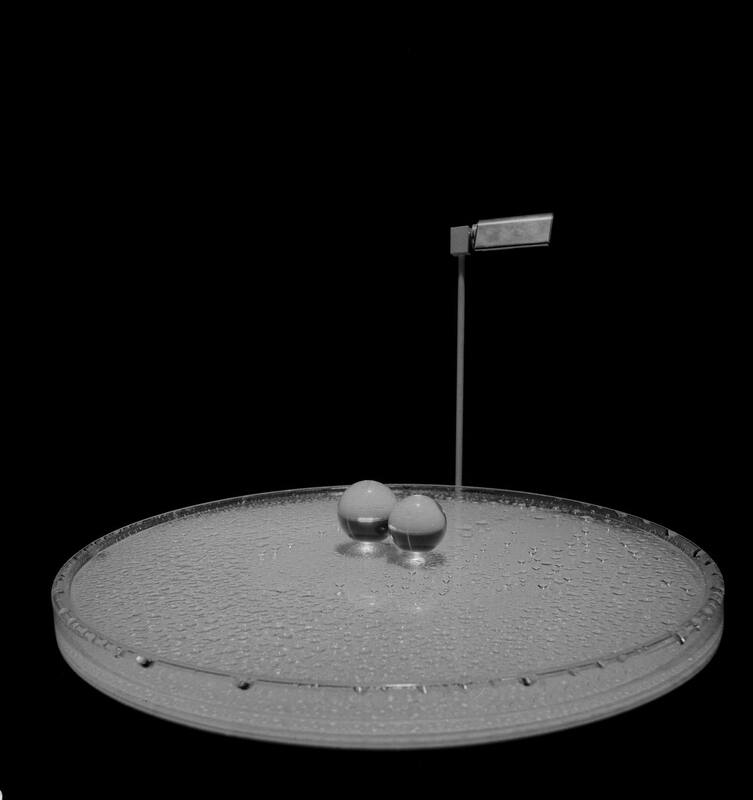 On its surface, two acrylic balls rotate, their motion subject to opposing forces: the centrifugal force of the spin of the disc and the centripetal force due to the concavity of the disc surface. When the water is first poured into the disc, it condenses into patterns that resemble interstellar clouds of gas, but soon it contracts into precise spherical droplets, alive and trembling, which in turn become increasingly homogeneous, covering the entire surface of the disc. The water in the disc both influences the total equilibrium and is influenced by it, exerting an effect on the movement of the balls. The movement of the balls on the surface of the disc is governed by the laws of momentum, as well as centrifugal force and the pull of gravity induced by the concavity of the disc. The balls also act as moving magnifying lenses, bringing to life now one area of the disc, now another, with a strange lunar landscape of reflections and shadows. Liquid Reflections is Lijn’s attempt to contemplate the universe on an intimate scale.